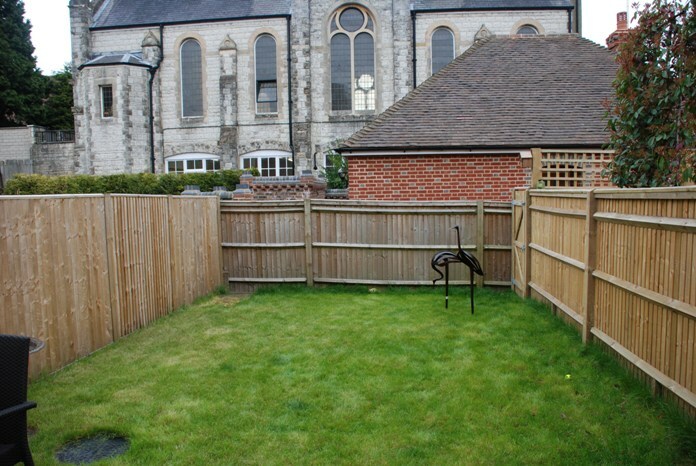 One of the first blog posts I ever wrote featured a courtyard garden I designed for a client in Reigate. 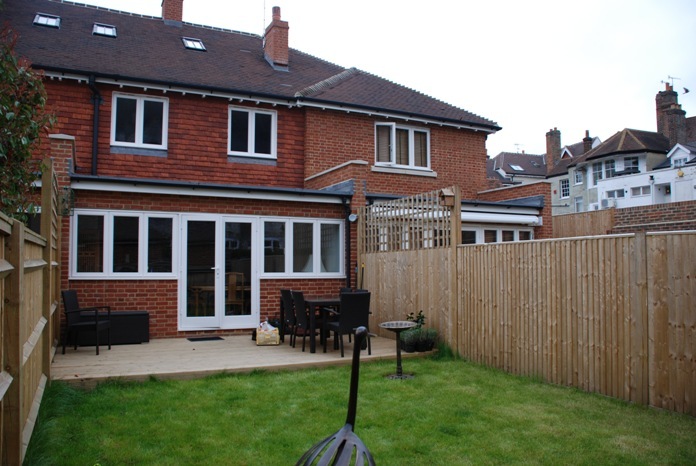 Whilst the build was in full swing my client was swept off her feet and by the end of the project she had accepted a proposal of marriage and decided to sell the house. The house has been let out for the last two years and I haven’t been able to go back to see how it has progressed. I’m sure you can imagine how thrilled I was when I had a phone call out of the blue from the new owner. For two years the garden hasn’t really been maintained and it had become a bit overgrown so he wanted some help to get it back in check. 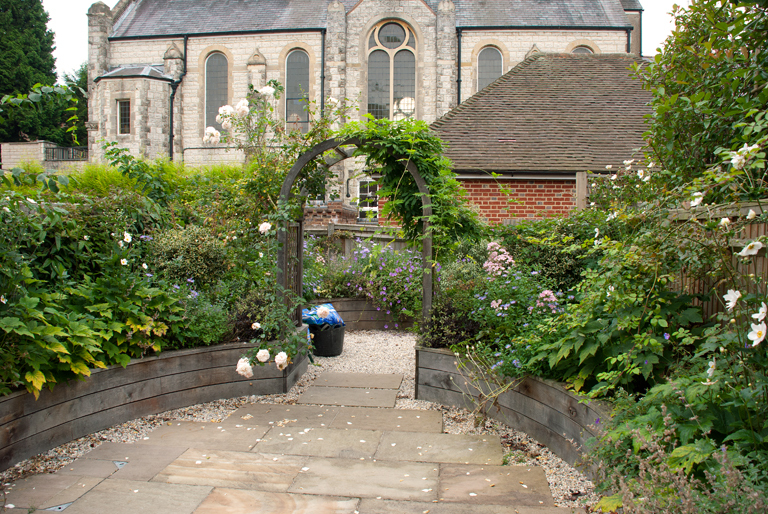 It’s a shame that I had to cut back some of the climbers which had scrambled through the plants rather than against the fence. I also had to cut back some of the geraniums and asters because they’d gone all leggy but there are still a few splashes of colour left. 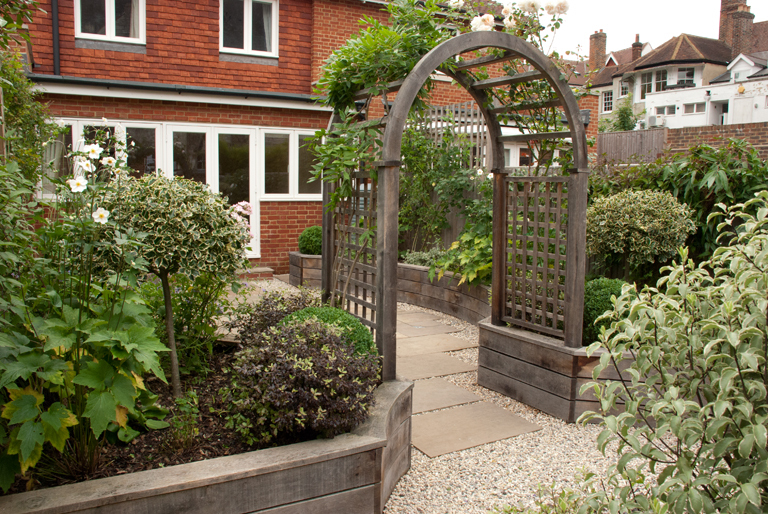 I think the new owners would like to add some trellis to the top of the fence and this will really help to make the garden feel more secluded….we didn’t have the budget when the garden was first built. 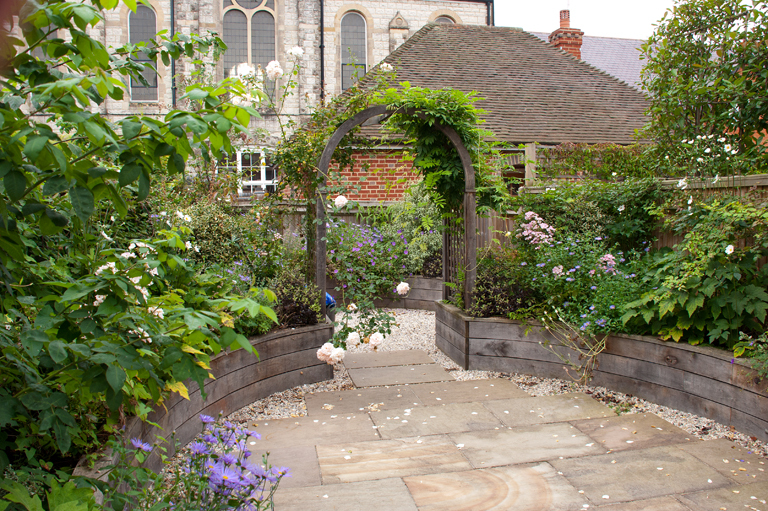 So I thought I’d leave you with the before, post planting and how it looks now pictures – it’s always great to see how a garden moves on and I think the romantic planting has now come to life. Not quite the same without the furniture and sculpture, but they’ll be easy enough to replace and I still think it has some “wow” factor, don’t you? how marvellous lisa! it certainly is WOW! just shows how good design stands the test of time! well done, its really fab. 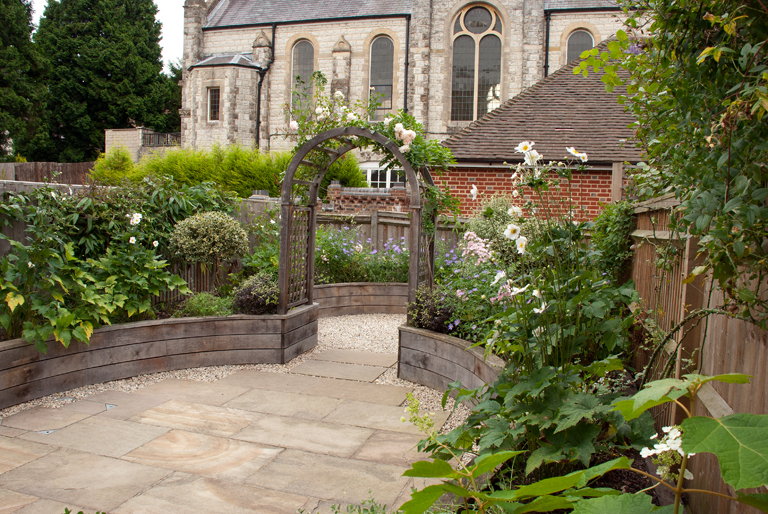 Lisa – i remember seeing this garden in one of your earlier blogs and am really impressed by it. 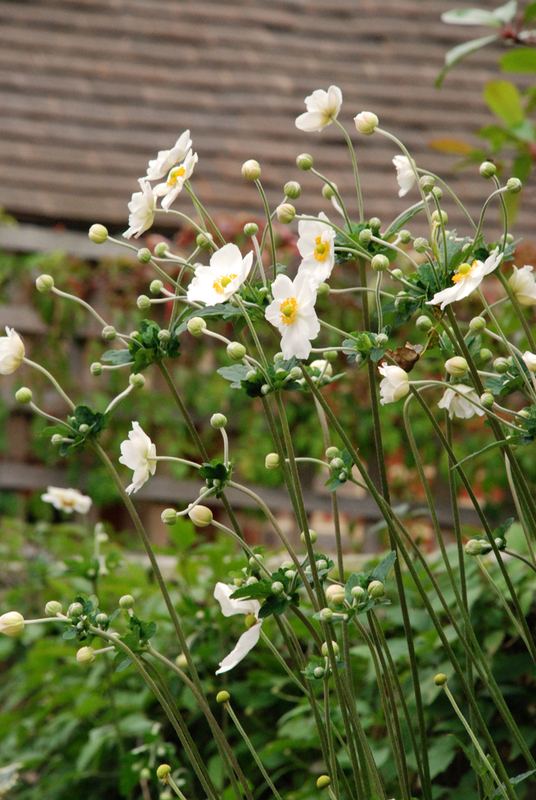 It is so pretty now the plants have aged and matured. I hardly get to see any of my gardens that far down the line and it does make a difference. 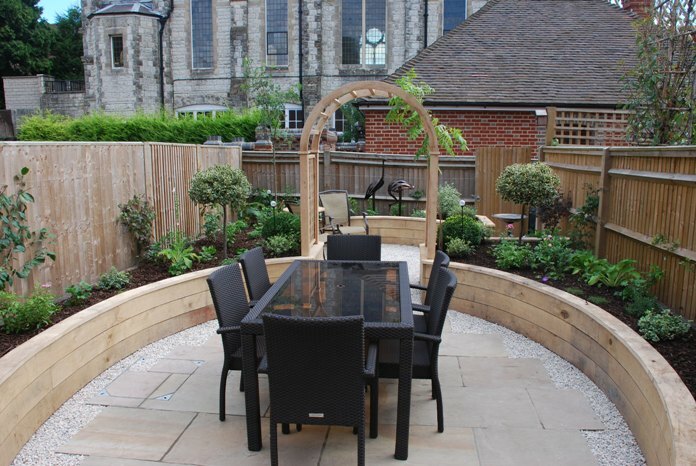 I have never tried the curved timber retaining walls before – are they relatively easy to install? Thanks Rosie – was so good to go back and see it. Needs some furniture and shame the sculpture has gone but so great to see how much it’s filled out! Thanks Sophie – I’m hoping to be able to go back and see it again next year – needs more regular maintenance to keep it looking good. 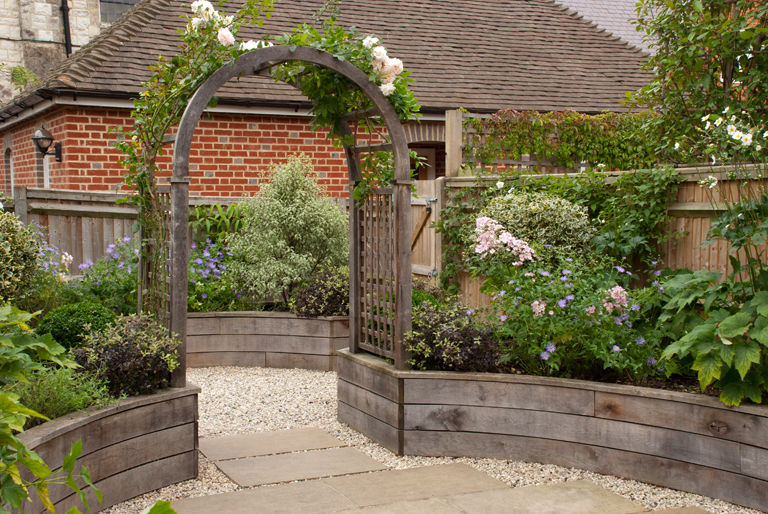 The curved raised beds were constructed by English Garden Joinery…softwood frame clad with green oak to give the same feel as sleepers. Lisa, it looks fab. I often have trouble getting back to gardens I’ve done a year or two ago but it’s sometimes worth the wait. I really love the shapes you’ve created and it completely blurs the boundary / fence. 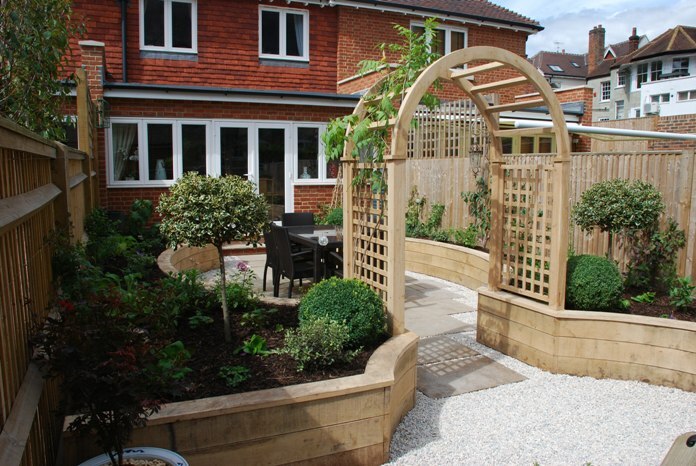 What wood did you use to create those raised beds, they are fantastic. Thanks Tracy – was very excited to be able to go back and see it! Timber is green oak. My client wanted the sleeper look but with curves so the beds were constructed with a softwood framework and then clad with green oak to give the sleeper effect. This looks fantastic! 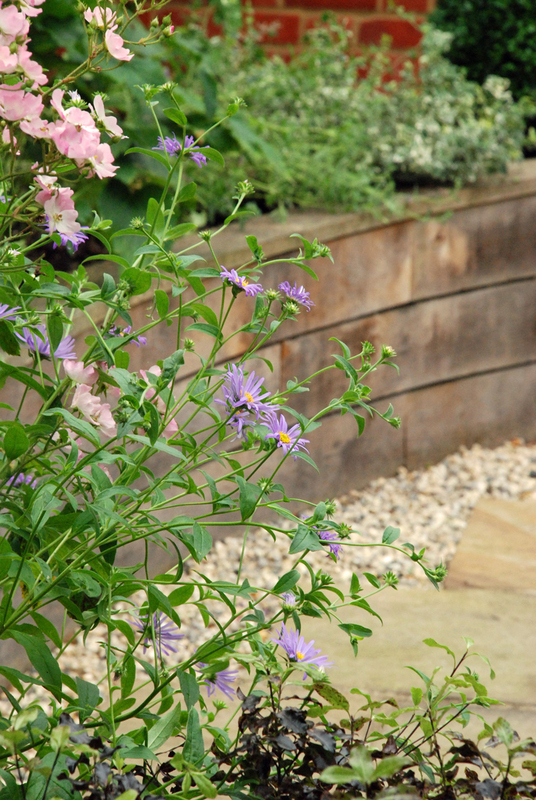 A further question about the wooden raised beds – are they constructed out of straight pieces of softwood and clad with much thinner (flexible) strips of green oak? Did you have a specialist create it? Thanks!